I know there is a service specification, so how much wear can ball bearings have and still be used? I can't find my service manual when I need it, but my main question is setting the ring and pinion. If I remember correctly, you set the pinion depth by aligning the edge of the pinion gear flush with the ring gear, but I can't remember it's aligned with the inner differential side or the outter side? Then you set the back lash by changing the shims from side to side until you get ~0.006" - 0.012" on the dial indicator. Is that correct? I will need to do this to my M so your pictures may come in handy for me. Hopefully my tractor won't be this extensive. My issues are brake shaft seals are leaking along with the input shaft seal. I'll look up the ring setting procedure when I get home. For bearings you can purchase the exact same bearing through Motion Industries or Applied Industrial Solutions for much less money. Motion is usually less money but Applied is who has all of the cross reference books for IH part numbers. I also have an IH bearing book that crosses the numbers, I can look those up if you send me a list. 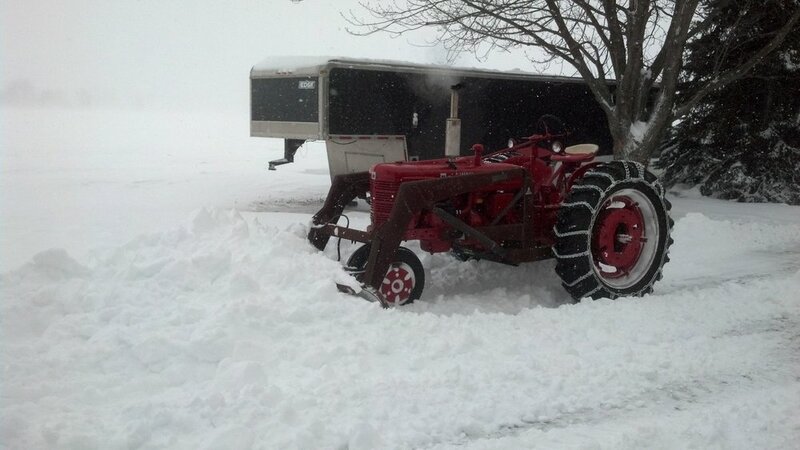 My Super H also has an M&W clutch, I would love to find a 9 Speed for it also for plowing snow! I don't know where you are located but I have four H tractors that are going to the scrapyard this spring. Don't buy new bearings, get good used ones. That's a good start, open it up see what you have??! !$$$$ due to wear and trans chips that started the failure you now have a major overhaul. the trans and final drive now is contaminated with metal, gear chips, pull down every thing else, record, mark the shims, wash every thing super clean, parts washer tanks work great for big jobs. lay every out on a table keeping organized, Bearings: get a bearing book, new bearing run .003 th running clearance, wore bearings over .010 th. should be rejected. measurement taken with clean bearing in hand slid a feeler gauge between the race and the ball ??!$$$$. A new bearing are not that bad on price$$ I take all my bearings or numbers to Applied $20 to $60 Seals; same thing, C/R numbers to new. When you make it back to the back lash setting start a new post so we can all scrutinize? Did anyone find a service manual that tells about setting the ring and pinion? Cooter ,I just did one that looked the exactly the same .Gears and all. Your correct on alignment. I bought 87% of my bearings and seals for belly pump and rear end all from Napa. Like 1/4 the price. The book is at the farm and I wont get there today .But I will monitor this late tonite to see how ya did. Asap had all the used gears ,I use Ben at Wisconsin Tractor 1-855-530-3432. Hes great ,if hes off ask for Cody. I think the procedure for this is in the Serviceman's Guide. I will look when I get home tonight. Not sure if you know this or not, but I have been using rock auto for bearings..............alot cheaper than local outlets, my brother bought all of the ones for the rear end for his 826 off of there. Cool, thank you! I've had hit or miss luck with NAPA, you just have to be careful. I have bought various bearings through them, opened the box, and they were china bearings. So they may have been cheaper than the dealer and Motion Industries, but they were cheaper bearings to begin with. CNH has gotten better too, they are back to using USA brand bearings, mainly SKF and Bower, so I feel more confident in ordering through them. Really? I was just on there looking and nothing came up when I typed in the bearing numbers. Is there a specific place I should be looking? I know the ST-227-B that carries the differential and inner axle superseded to a different part number through CNH and spit out an SKF bearing, so maybe I will have to put those numbers in and see what comes out. Well I’ve got some fantastic deals on eBay for bearings on eBay . I find the cross reference for the bearing. Then I do a search on eBay. You got look SKF quality bearings the picture and the product my not match. It may be Chinese not skf for example . This is a warning to know or ask about if not sure. Also there may mention 2 new and 5 refurbish, caution on them . You want get timken ,skf,fag,new departure, Torrington , koyo . you can buy shield bearings for a great price ,and physically remove shields and create an open bearing. For example. It is amazing those bearings lasted as long as they did. How many revolutions you suppose they made? I have seen many like yours. Those were good quality bearings when built and you will not find the same quality replacements. You probably will not be taking it to the field daily. Find better used ones or find a good place to buy new for a reasonable price. While there, remove the axle housings from the center section and replace the gasket. If you do not, it will leak a month after putting it back together. Murphy's Law The inner axle bearings were also known to fail. Mine did. Look at them while the axle housings are off. You can either buy the gaskets or I have made them out of a Wheaties box or real gasket paper. Anything new is better than the antique gasket in there now. Check or replace every bearing. Replace every seal and gasket. You need to do everything while apart. I done it as needed and I will again have the top cover off to go through my transmission. Should have done it before. My bad! I use the Timken cross numbers...........should get you something. I didn't have any luck looking up bearings on Rock Auto 😕, which is a bummer because I order lots of stuff from them. I even tried using the new SKF numbers on the bearings from CNH, but still didn't come up with anything. I forgot to look on ebay for bearings too. SO, I was at the mercy of Mother Fiat to provide me a supply of new rollers 🤕 BUT, the same bearings were cheaper through the dealer than they were at Motion Industries, so I guess that was a win. So here is where I am at: Lots of new bearings and a few used. I had a set of good used outside axle bearings and a used the differential bearings off my parts tractor on the inner axle; which had more balls that the ones that failed. Lots and lots of cleaning to get all the debris out of the transmission and axle housings. There was some fabricating and problem solving while installing the M&W 9-speed, but it is 80% back together. 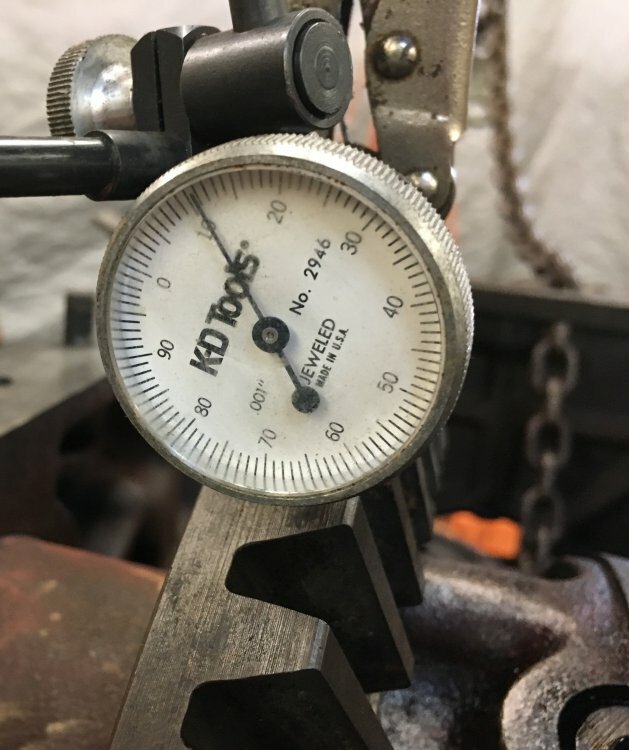 I did set the ring and pinion for final back lash of 0.007 with the shims I had; I figured that with new bearings it would wear in some and get me back to around 0.010 over time. Whether that was the right decision or not, that is the logic I used. It took over an hour of swapping the shims side to side to find some correlation of shim thickness vs backlash change to get a handle on where I would finally end up. Hopefully it doesn't howl. There are a lot of new gears shaking hands now and they need to get along. My new addition, since I had everything all apart, was M&W hydraulics. I wasn't sure where exactly sure how it went on, so I fabricated my own set up. Good or bad, I will soon find out if this was a smart idea or not. I wanted to keep the belly pump because I have a cultivator hydraulic valve I want to put on in the future, and that needs the belly pump to work correctly. I did my best to make this modification as unobtrusive as possible, so I hugged the housings as close as I could and tucked the filter in behind the pump. You can still see it's there, but it looks ok, I think. Maybe if I painted it wouldn't stick out so bad. Plus, the pump protects it some. My thought was to try and tuck it under the frame rail just before the suction line snakes past the engine oil filter, but since I had the M&W line, my filter addition got put here. Since I was now pulling oil out of the belly, I needed to figure out how to put it back. I toyed with several ideas and finally came up with using the belt pulley housing as part of my return. As I opened it up to see if it was possible, what did I find...........SHOCKER...........more bad bearings. In retrospect, I knew the end bearing was bad because when I would belt it up at the steam show it growled horribly and would sling oil, so I knew replacement was in the works. I haven't' figured out how much oil I am going to need to run in the rear to make the hydraulics work. That's a few steps down the list.